Text Copyright (C) 9 December 2017 by Bob Hurt. All rights reserved. Distribute whole freely. 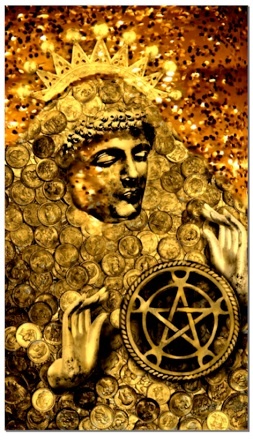 Bitcoin, the original cryptocurrency, came into existence in 2008 when Satoshi Nakamoto devised and implemented a computer network algorithm which encrypted a buy/sell transaction into a data block and inserted the block into a chain of blocks. The algorithm guaranteed each new block an absolute position in the block chain, and rewarded the network computers that verified the block encryption process by issuing virtual money of one "Bitcoin," putting that transaction in the block chain as well. The Bitcoin rewards occur randomly. Don't let the photo mislead you. Bitcoin is virtual, not physical currency. Unlike golden and silver coins, no physical Bitcoins exist, so you cannot hold Bitcoins in your hand. 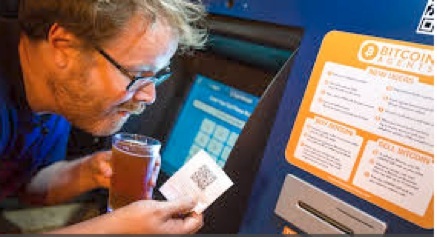 Last year the Bitcoin rewards occurred at the rate of 125 per minute worldwide. Today they occur at 12 or fewer per minute worldwide. Thus the process of verifying blocks in the blockchain in exchange for a Bitcoin reward became known as "Bitcoin mining." The first known use of Bitcoin in a financial transaction occurred when a pizza vendor accepted 10,000 Bitcoin for an order of pizzas. 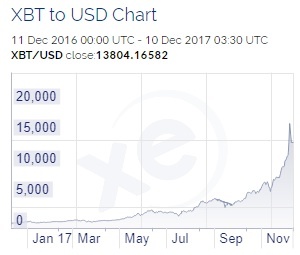 The dollar value of Bitcoin has risen ever since until it reached $1000 in March 2017. And then the price took off like a rocket to the moon. The International Standards Organization adopted ₿ as the Bitcoin currency symbol (&#x20bf; in hypertext markup html). Financial entities have accepted XBT as the text symbol of choice because the more popular BTC symbol conflicts with the country symbol for Bhutan. Bitcoin has experienced tremendous popularity. In March 2017, one Bitcoin sold for $1000. The past three months have seen Bitcoin prices jink upward from $3,700 to over $19,000 3 days ago. Just now it hovers at $14,200 as traders try their best to "buy low and sell high," driving the price up and down like crazy. People worldwide yearn for Bitcoin to stabilize in its inexorable climb upward, for several reasons, but principally so it can become the defacto international currency away from the control and taxation of any and all government. Investing in Bitcoin has made it easy for investors to grow their money with no effort at all. In order to purchase Bitcoin with US dollars, one must open an account at a "digital wallet" provider like Coinbase.com,Coinmama.com, or Payza.com. Then one must deposit some money in the account using credit card or bankwire. Wallet providers don't like credit card deposits because of the risk that customers will demand a chargeback. One may then purchase Bitcoin or other cryptocurrencies with the deposited money. Then one need only watch the cryptocurrency value jink away. Yours Truly enjoys GDAX.com because it shows real time Bitcoin trading. Second, some enterprises have decided to compensate their workers in Bitcoin. For example, USI Tech, an automated FOREX (foreign currency exchange) software developer, started accepting partners and clients from the general public. The client enrolls under an existing USI partner, then elects to become a partner by accepting the terms and conditions. Clients only grow their money, while partners enroll new clients and show them how to grow their money. Growing money consists of purchasing BTC (Bitcoin) "packages" for the Bitcoin equivalent of €50 each and receiving income from them each business day. USI repays the package cost plus 40% in daily 1% increments over a period of 7 months. The client may elect to "rebuy" packages with package earnings, thereby compounding the earnings from about 60% APR (annual percentage rate) to 250% APR. USI distributes a 35% commission to 12 levels of upline partners, with 10% going to the level 1 partner under whom the client enrolled. USI provides a nice advertising page for the partners, and a convenient on-line enrollment form for new clients. USI Partners and clients feel delighted to see Bitcoin price rising rapidly. Bitcoin price declines don't bother them much because they know it will go right back up in a few hours or days. Imagine your dismay if your periodic paycheck fell in buying value 25% the day you receive it. How long would you remain employed with a company that paid you in such "funny money"? Well, to address the matter more fairly, let us confess that someone who enrolls at USI does not depend on the company for a periodic paycheck. Furthermore, a fledgling partner could have in the past two months built a USI package and account balance exceeding $25,000 in value, despite today's depressed Bitcoin price of $13,500. Remember the $7,280 Bitcoin price of one month ago, and $4255 two months ago. Who could complain about the price jinking up and down while it inexorably climbs higher and higher overall? People who buy Bitcoin WANT it to climb ever higher in value. Why does it climb so high so fast? Yours Truly has a few considerations to share as partial answers. Bitcoin has an absolute limit of 20 million Bitcoin in circulation, and has so far reached about 17 million. By comparison, no end exists for the distribution of US dollars in the form of federal reserve notes. The US Congress has ordered the printing of trillions more in federal reserve notes than it takes in. Such deficit spending destroys bank deposits of federal reserve notes through inflation, like a back-end tax on savings of government's fiat currency. Thus, the shortage of Bitcoin makes it more precious and desirable than US dollars, and that drives the price up even though speculators jink the price up and down around its ever-climbing average value. We in the USA should consider ourselves lucky currency wise compared to the people of Zimbabwe. Mugabe's recent fall from power there brought with it a further dramatic decline in the value of Zimbabwe's new national currency, the bond note, which he had released on November 28, 2017. The people of Zimbabwe strove to get and use US dollars (federal reserve notes), but the fortunate ones started trading with US Dollars or Bitcoin. That drove the international price of Bitcoin upward. And so we can see the value of Bitcoin and other cryptocurrencies becoming a new and much more reliable kind of international unit of exchange that people can use for purchasing necessities, especially in war-torn or financially crushed economies in third world countries like Zimbabwe. Cryptocurrencies also provide a medium of obtaining mortgage loans internationally, without government and national banking restrictions. People can put up their Bitcoin holdings as security for loans. Bitcoin, because of its rising value, provides much better security than does real estate which borrowers in financial distress always neglect, causing its value to decline. Bitcoin can solve a lot of financial problems internationally, but it brings its own problems. Bitcoin's dramatic price jinks make it unsuitable for use as a standardized currency for daily use in paying bills and payrolls and buying commodities. Workers want to know in advance what their paychecks will buy. Since no law requires a vendor or landlord to take Bitcoin in payment for products, services, or rent, Bitcoin cannot function as a common currency with a reliable value. On the other hand, no government regulates Bitcoin production, mining, quantity in circulation, or value in national currencies. That alone gives Bitcoin great value, especially for people who want to make monetary transactions away from government scrutiny. Government, you see, has regulated, criminalized, or taxed the buying and selling of sexual services, human beings, human bodies and organs, explosives, military armament, stolen goods, and so on. Bitcoin encourages circumvention of taxes and regulations, and participation in criminal transactions. Because of this, governments' legislators and law enforcers struggle to devise ways to penetrate the secrecy of cryptocurrency transactions. They have decided to attack the companies that provide cryptocurrency traders with digital wallets. Last week, the IRS obtained a court order requiring the cryptocurrency wallet provider Coinbase to hand over 14,300 records of transactions exceeding $20,000 in 2014 and 2015. So much for the privacy rights of those cryptocurrency traders. Government snooping makes everyone nervous because of the intensity of government tax collection efforts. Bitcoin transaction time deters many from relying on Bitcoin for day to day purchases. Unlike with common fiat currency like federal reserve notes, Bitcoin transactions take some time, ranging from two or three minutes to fifteen or twenty minutes, to complete. The higher the volume of transactions the longer it takes to put them into the blockchain and get verification of the transaction from several computers in the blockchain network. And digital wallets have not become universally simple and convenient to use, typically not as convenient as pulling $20 out of your wallet and handing it to someone. Nevertheless, smart phone and smart watch applications using NFC (Near Field Communication) and QRCode scanning capabilities can simplify the initiation of buy/sell transactions, such as in a coffee shop that accepts Bitcoin. In spite of its drawbacks, Bitcoin stands closer to becoming an international currency accepted worldwide for many kinds of transactions. Yours Truly believes that it will continue in that vein until a much better-planned cryptocurrency takes its place. Jealous governments will surely make their own cryptocurrencies, like the Federal Reserve's "FedCoin," and force people to accept them as a medium of exchange. If that happens, the US Congress will have to devise a limit on the production of the FedCoins lest they become ever-more worthless like federal reserve notes have. Without that limit, Congress will spend more FedCoin than it takes in, and that will create an overabundance that will drive down the value. So Yours Truly does not see the FedCoin replacing the Bitcoin any time soon. Meanwhile we should not naively think that Bitcoin can become a fully functional international currency in spite of its value volatility. In fact, if ever a time existed to buy Bitcoin, that time has come throughout the past 9 months. •click here to cut to the chase and enroll under Yours Truly right now.